Cambozola (Triple Creme Bleu) - Zuercher & Co.
Kasseri Champignon makes this cheese in Bavaria. 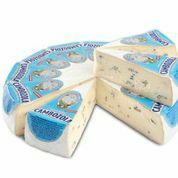 A soft ripened cheese that is nice and creamy with bites of blue throughout. The rind is bloomy and white, the paste soft and creamy with flecks of blue. It’s not a brie and it’s not a blue. Cambozola has a flavor that sets itself in a league of it’s own. It is a nice way to introduce someone to blue style cheeses because the flavor is mild and not overwhelming.